A single-parent woman gets a home with the help of the “Second Chance” program of Habitat for Humanity in Zugló. The program, resulting from the cooperation between the municipal, business and civil sector provides a long-term affordable home for the family. Erika with her 10-year-old son is currently living in the temporary family shelter operated by the Social and Rehabilitation Foundation . As a single-parent, she had no other choice to solve their housing, but the shelter offers only a temporary solution. This is not a one-off case: today in Hungary at least 50,000 families are under the threat of becoming homeless, and only 1% of families that lost their housing get temporary accommodation in these institutions. Temporary family shelters offer a bail-out for families on the verge of homelessness, but they do not provide a permanent solution. People in trouble can move into safe and affordable flats only with great difficulties, and this is almost impossible for single-parents. Cheap public rental flats could provide a solution for these people, but there are only a small number of these flats in Hungary. “From the beginning, we worked to make our own home with my husband. Finally we bought a 1.5 room apartment, then the franc based loan took everything. We had to rely on rented housing, and my husband had a breakdown because of it. When I finally moved out from his place, I could not pay the security deposit of another flat any more, with my son we had nowhere to go. I never would have thought that we can ever get into such a situation…” – Erika tells their story. The ambassador of the “Second Chance” program of Habitat, Nóra Szekeres also helps in the refurbishment of the public rental flat where Erika and her little son can soon move in. Habitat refurbishes the real estate offered by the Municipal Office of Zugló from donations received from supporters, with the help of volunteers. “This is not a gift, it is an opportunity, and I see that people who get this opportunity can really live up to it” – says Nóra Szerekes at the construction site. “It is a basic right for everybody to be able to leave from a safe home every morning and to have some place to go home to. If this is already covered, then you can move on, and build a safe and happier life for your children. This is what we are working on right now” – she added while painting. “This year, our program allows only a few families, two single mothers among them, to move in a public rental flat in Zugló and in the XV. District. Besides them, more than 1,000 families live in temporary family shelters, where most of them there is no way to get a real home. Our program introduces a working solution that can provide safe home for ten thousands of homeless families” – said Luca Koltai, the operative director of Habitat for Humanity Hungary. We at Habitat for Humanity think that a just housing policy is needed that can prevent families to become homeless and can provide a chance for people who lost their housing to live in an affordable, safe home again. One-third of single-parent families live in poverty in Hungary, and many benefits are not even available for them. Losing their housing can eventually lead to the breaking up of families. “We also see in Zugló that an increasing number of families exist that cannot buy their own housing under the current market conditions, and also cannot afford a rented flat. A governmental public rental housing program would be much needed, but in the lack of this, the municipality has to find a solution for the increasing housing poverty” – says Rebeka Szabó, the Vice Mayor of Zugló responsible for social issues. The Municipal Office of Zugló have implemented numerous measures to prevent the loss of housing and to achieve a more just and transparent allocation system of municipal rental dwellings. “It is also our prioritized goal to improve the condition of rental flats, and this is where the Second Change program of Habitat helps a lot, as it allows single-parent families to get a fresh start in a flat refurbished with joint work – people who otherwise may not have succeeded in this. 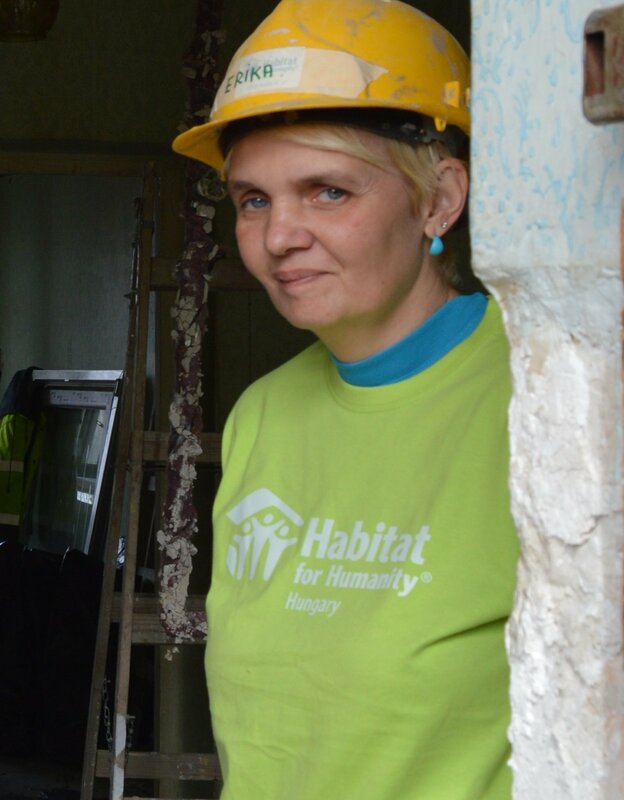 Thanks for the Habitat for letting us to participate in this constructive program!” – said Rebeka Szabó. The complexity of cases that got into the scope of temporary social care during the past years have driven the Social and Rehabilitation Foundation (“SZÉRA”) to develop a professional program that helps to stop the negative trends and provides sufficient motivation and perspective for care recipients to take steps towards an independent life. Based on this, they have elaborated their own reintegration program, which have been already operating successfully within another organizational framework for more than 10 years now in Budapest. However, the joint action in Zugló is now placing the addressing of housing issues on a completely new basis. The social responsibility of large companies and the for-profit sector can open new horizons in the Hungarian social and child protection provision, as it ensures additional resources that cannot be acquired otherwise. This is another reason why the joint program of Habitat, the Municipal Office of Zugló and the SZÉRA is innovative and exemplary. Executive Assistant and Office Manager wanted!